It is impossible to be certain about the origins of Thomas Russell, but there is ample evidence to show that he was closely connected with Barton-under-Needwood and neighbouring districts. We know that his sister, Joane, married a Thomas Bailey, yeoman, of Marsh Barn Farm, Handsacre, near Armitage, a property which Thomas Russell bought from his brother-in-law in 1591. We also know that his niece, Margery Russell, married Thomas Temple of Barton-under-Needwood in 1573. He owned property in Barton and Dunstall. In his will he bequeathed some of his Barton property to Thomas Holland, the younger, and he instructed his executors to sell all those cottages, close, meadowe called Bruckhouse Feild, also Bruckhouse Closes lying, and being in, the County of Staffordshire ‘. There is a field called Brookhurst on the 1839 Tithe Map of Dunstall ( Ordnance Survey Grid Reference 189197 ) and this is probably the same piece of land. He provided money to buy bread for the poor in the parishes of Colton and Blithfield, as he had previously done for the poor of Barton. And finally, he left money for the building of a school in Barton and endowed it with funds. The Court Rolls of the Duchy of Lancaster show that there were Russells in Barton as far back as 1414 and the name appears regularly in the rolls up to the 25th.October, 1529. In 1515, some Russells occupied cottages and land at Cotland Croft and Humberlond Siche in Barton. None of this proves anything, but it provides us with very strong circumstantial evidence. Unfortunately, the church registers do not start until after Thomas Russell’s presumed date of birth. The Tatenhill register dates from 1563 and the Barton register starts a little later, in 1571. 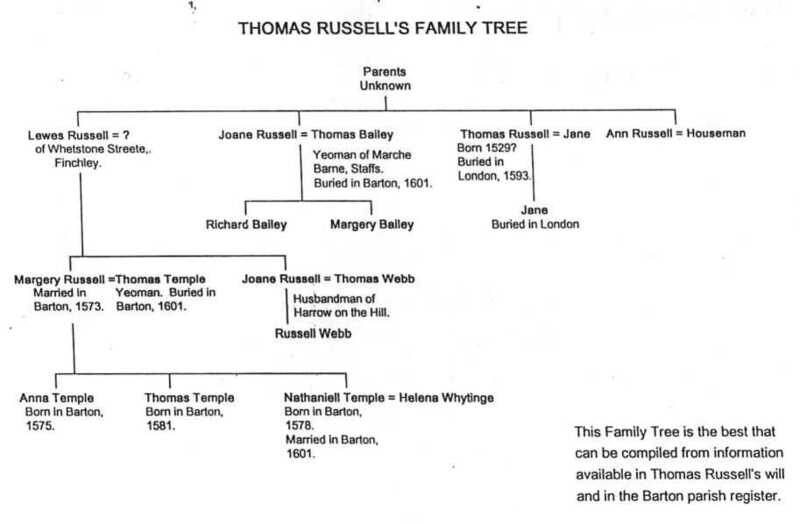 Whilst we have no precise documentary proof that Thomas Russell’s family came from Barton, they must have come from the area, if not from Barton itself. The following excerpt from a letter written by the School Visitors, ( residents of Barton ), to the Drapers’ Company, dated 28th.May, 1600, would seem to make this quite clear. It reads, “ Whereas Master Thomas Russell, one of your companye latelie deceased, hath a greate charitie towards his native countrey to his singular commendacon erected a Schoole heare at Barton in Staffordshire and given continuall mayntenance for a School-master and Usher “. They obviously considered him to be a local man. We do not know how he came to be in London. Three possible theories come to mind. The first is that Thomas Russell was born in Barton and that the whole family moved to London before Thomas was fourteen years old. The second is that his parents left Barton before Thomas was born, and the third is that Thomas left home on his own to travel to London and seek his fortune. Personally, I feel that the second theory is the least likely, but I doubt if we will ever know the true course of events. The first definite piece of information about Thomas Russell’s early life is to be found in the records of the Drapers’ Company in London. An entry in a ledger at Drapers’ Hall shows that Thomas Russell was bound as an apprentice to John Thompson, Master Draper of London in 1543. If we assume that Thomas was then fourteen years old, the usual age of apprenticeship, then his date of birth would have been 1529. Thomas Russell was freed of his apprenticeship on the 4th.March,1550. If our previous supposition is correct, he would then have reached the age of twenty-three. His will reveals that he became a very prosperous and influential member of the Drapers’ Company, but he never became a Master of the Company. An extract from a ledger in Drapers’ Hall. The entry shows the names of Thomas Russell and John Thomson. Thomas Russell of London ( Draper ) £2 – 12s. – 0d. to be paid by the Worshipful Company of Drapers of the City of London to the Chapel Wardens of Barton at two payments, viz. St.John the Baptist’s Day and St.Thomas’s Day, yearly by even portions with which twelve penny worth of white bread is to be provided and distributed to the poorest Inhabitants of the Township on each Lord’s Day for ever. 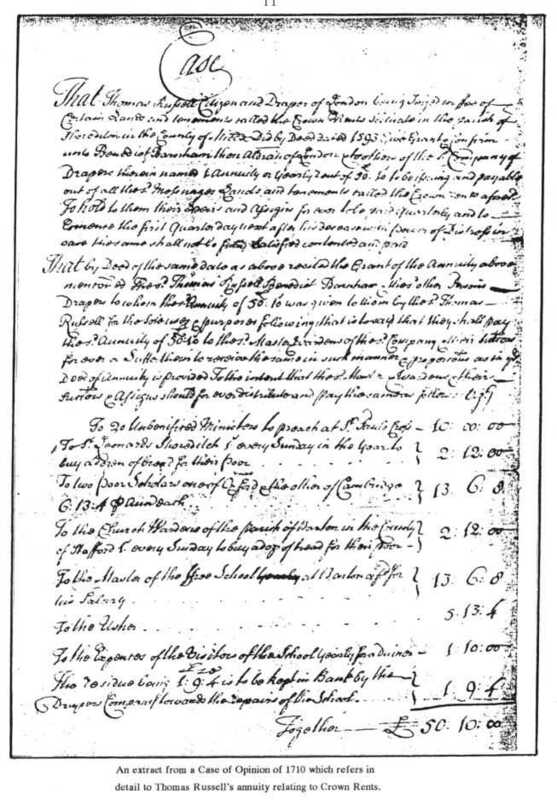 NOTE :- This is part of the annuity of the 6th.July,1593, concerning the property of Crown Rents, Shoreditch, London. Apart from his interests in Staffordshire, Thomas Russell owned much property in the City of London, Barnet, Finchley and Shoreditch. The property in Shoreditch is of particular interest to the village of Barton-under-Needwood. 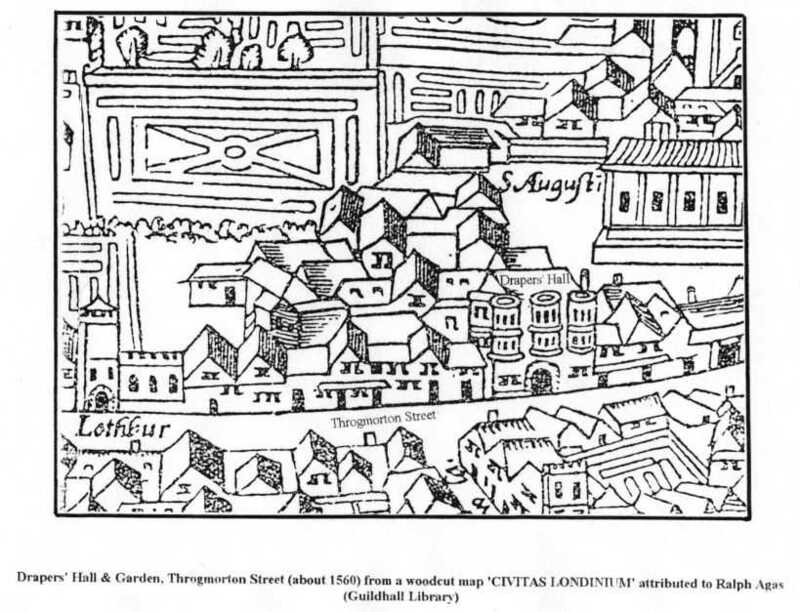 Thomas bought this from George Goddard in 1563.. Stow’s Survey of London, referring to the property at the end of the sixteenth century, described it as “ one row of proper small houses with gardens for poore decayed people “ reaching from the bars of the City northwards and belonging to the Priory of St.Mary Spital before the dissolution. After the suppression of the monasteries the property fell into decay and became known as ‘Rotten Row’, although its correct name was ‘Crown Rents’. These properties “ were solde from Goddard to Russell, a Draper, who new builded them “ and they became known as Russell’s Row in his honour. Another source describes the properties as “ one Messuage, twenty-nine cottages and thirty gardens “. Part of this land was later bought by the Great Eastern Railway Company ( 1869-1870 ) for extensions to Liverpool Street Railway Station. A page in a ledger at Drapers’ Hall showing Thomas Russell’s name and that of his Master, John Thomson. An annuity dated the 6th.July,1593, provided that the annual rent from Crown Rents, amounting to fifty pounds ten shillings, would be paid to the Drapers’ Company and used for various charitable purposes. These included the salaries of the staff of Barton ‘Free Schole’, the Master receiving thirteen pounds six shillings and eight pence annually and the Usher five pounds thirteen shillings and four pence. One pound ten shillings was allowed for the annual dinner of the Visitors of the school, local people who were supposed to inspect the school each year between Easter and Whitsun and report back to the Drapers’ Company in London. The sum of one pound nine shillings and four pence was set aside for school repairs. Another source gives the Master’s salary as thirteen pounds and the sum for repairs as one pound sixteen shillings and eight pence. A further sum of two pounds twelve shillings was given to the churchwardens of Barton-under-Needwood for the distribution of twelve pennyworth of bread ( at thirteen loaves to the dozen ) to the poor of the parish on each Sunday throughout the year. At the time of his death, Thomas Russell had a house and a shop in Lombard Street in the City of London as well as a ‘greate warehouse’ in Birchen Lane. Many other properties are mentioned in his will. He had become a very wealthy merchant, employing many people and having three personal servants..
Thomas died on the 23rd.July,1593, and it was his express wish that he be buried at the church of St.Edmund the King in Lombard Street where his first wife and his daughter, Jane, were already buried. Unfortunately, we cannot prove that he was buried there because there are no remaining parish registers of the City of London churches prior to 1670. The Great Fire of 1666 destroyed ninety City churches and their registers. The present church of St.Edmund is not the one which Thomas Russell knew. It is recorded that, on the morning of his funeral, members of the Drapers’ Guild left Drapers’ Hall to walk to the church (not far away) to attend the service, returning to the Hall afterwards for a funeral dinner. Thomas had left thirteen pounds six shillings and eight pence ( or twenty marks ) to pay for the dinner. He also left the Drapers’ Guild a gilt and crystal cup to be a ‘perpetuall memorye’ of himself. Instructions were given for a portrait to be painted and hung in Drapers’ Hall, but we do not know whether these instructions were ever carried out. If a portrait had been painted, it would almost certainly have perished in the Great Fire. The Drapers’ Hall mentioned in the last paragraph was the Mansion built by Thomas Cromwell, Earl of Essex, in Throgmorton Street and occupied by him until his execution in the Tower of London. 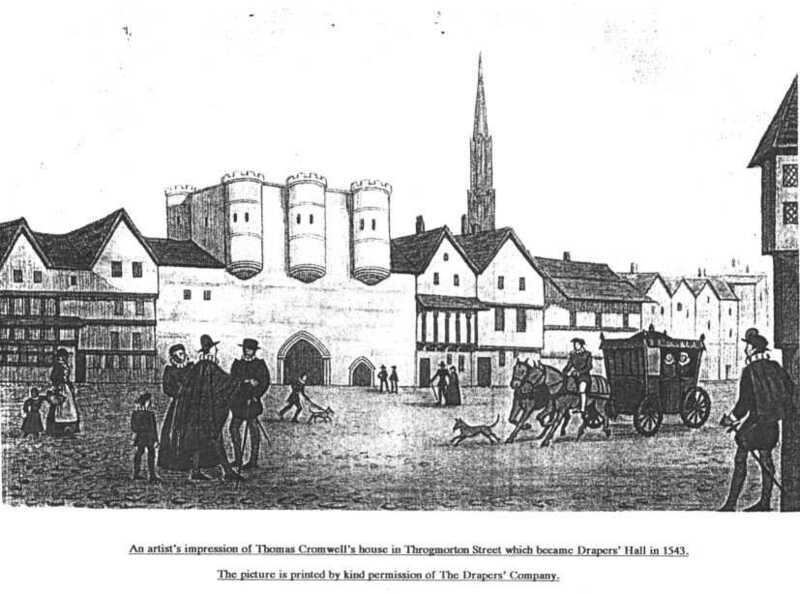 The Drapers’ Company bought the house from King Henry VIII in 1543, moving there from their old Hall in St.Swithin’s Lane in August of that year. Thomas Russell began his apprenticeship in the very same year, so the new Hall was the only building he knew. The following names have been extracted from the Court Rolls of the Duchy of Lancaster (Bundle 110, No. 1656 , and Bundle 112, Nos. 1700 and 1701) as they appear in Sir Reginald Hardy’s book ‘A History of Tatenhill’. The intention is to show that the names Russell and Temple were common in Barton long before Thomas Russell’s time. One of these Russells might well be Thomas’s father. Johannes Russell The names are spelt as they appear in the Court Rolls.The name Russell does not occur after 1529. 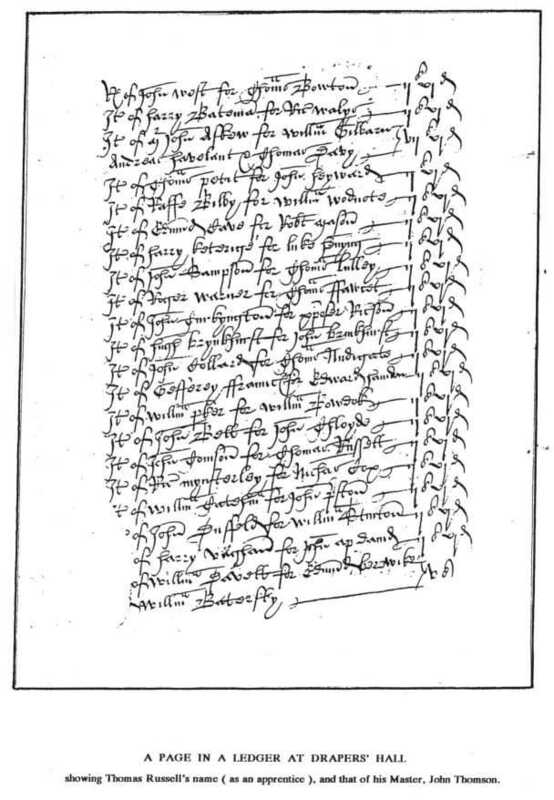 Thomas Russell’s will is dated the 7th.July, 1593, in the thirty-fifth year of the reign of Queen Elizabeth I. I have included a complete transcription of his will in this short history because it gives us invaluable information about Thomas as a person and the times in which he lived.